Timeless and classic, this stunning solitaire diamond ring from The Forever Diamond will take her breath away. Crafted from 18 carat yellow gold, this ring features a diamond hidden inside the band for added indulgence, as well as a white gold claw setting to accentuate the beautiful diamond solitaire totalling 1/4 carat. Each Forever Diamond has been independently certified by the GSI for colour, clarity, carat and cut. 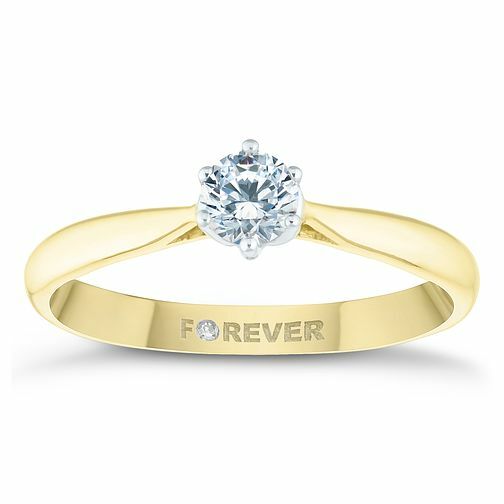 18ct Yellow Gold 1/4ct Forever Diamond Solitaire Ring is rated 5.0 out of 5 by 1. Rated 5 out of 5 by Anonymous from Beautiful present I got this ring as a Christmas gift from husband. It is just the perfect fit ring with gorgeous sparkling diamond. It’s perfect for my everyday size use.